We take great pleasure in congratulating Ravi Ammigan for bringing his Doctorate in the Internationalisation of Higher Education to completion. 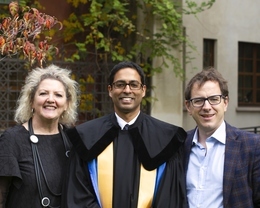 Ravi has just been awarded his PhD after completing the programme at the Centre for Higher Education Internationalisation with the Faculty of Linguistic Sciences and Foreign Literatures at Università Cattolica. Along the way, he has managed to author and co-author eight international articles, win a visiting research appointment in Melbourne and present regularly at conferences, while holding a demanding position of responsibility as Head of International Affairs at the University of Delaware, not to mention starting a family! Ravi has been wonderfully collaborative with his peers, generous in his support of new students coming on to the programme, and a delight for his two supervisors, Elspeth Jones and John L. Dennis. Everyone in the Centre is justly proud of his research. His important discoveries of the associations between the different dimensions of international student experience and overall satisfaction with, and recommendations of, the university, drawing on ISB data, are ground-breaking. We look forward to seeing him make waves in the research community in the future. Congratulations Dr Ammigan!